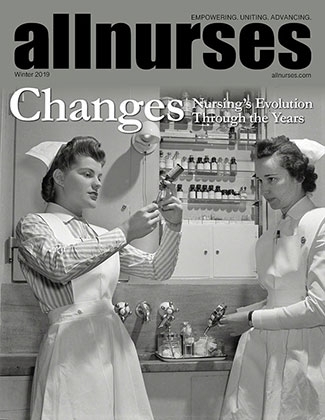 So I am wondering what has happened to nursing over the past years. We used to care, be compassionate and have now become nothing but bossy hated people. Examples - Nurses do not want spouses back in pre op - well first of all that is their right if they want their spouse with them. I had an experience where they actually closed the curtain on my spouse and said its easier on us if youre not here. who cares if its easier on you. people going into surgery are nervous and scared and if having their spouse with them so be it. STOP being bossy as your word is final. it is not. the patient has the say in what goes on with their treatment not you. You screwed up putting an iv in and when questioned you get pissy. bluegeegoo2 has 11 years experience as a LPN and works as a LPN. Lets see if we can figure this out. Long time nurses (or at least short term who feel like long term) who have been dragged through the ringer multiple times by patients, families, other staff, admin etc. want to keep the BS to a minimum during their very busy work day because they are running around with multiple demands from everyone. Or, could it be that the nurse did not screw up putting in the IV (it is hard sometimes bc of bad veins or in this case probably dehydration) and didn't like the "spouse" telling them they don't know how to do their job. Or, could it be both! Hmmm, think we might have an answer here? I don't think it's unreasonable for a nurse to appropriately limit unnecessary distractions in order to ensure a patient's safety. You're free to decline appropriate safety measures by declining medical treatments all together. Typically, PACU's don't outright ban support/family members but this is determined on a case-by-case basis. A patient-family member dynamic that suggests more than a tolerable amount of drama (such as what your post screams out) wouldn't be allowed to ensure safe and effective care of yourself as well as other patients. Patient- care and safety is #1. If families present are intervening in said care and safety, I will not hesitate to ask them to step out. Using an example of yours, there is not a lot of space with those curtains ... on top of everything else. Then add a spouse ... I could be doing an assessment, changing a dressing or removing a glorious array of tubing and YOU are intervening in that care so out you go. Well I’m sure presenting yourself as this bright ray of sunshine just had the nursing staff tripping over themselves to give you a warm reception while they are trying to take care of the patient as you tell them how great they are at doing their job. Being a supportive family member and not a pain in the rear will probably get you a better attitude from your spouse’s nurse. Another thing to consider is that HIPAA privacy laws are taken to an extreme these days. Preop areas are often only separated by curtains and there are many patients within earshot of each other. While your spouse is having surgery and needs to be there, as uncaring as this may sound, you do NOT have to be there with them. Your spouse has a right to privacy by not having a bunch of family members of other patients overhearing his/her private health information because of the tight rooming conditions and other patients have that same right. The hospital is responsible to make a reasonable attempt to maintain this privacy. This sometimes means that family members may not be permitted in some areas. If I have to project my voice as if I’m giving a speech to obtain a health history, it’s bad enough that the other patients will liking hear the conversation. Their families don’t have to be there to listen to it too. Your concerns would be better directed to the Patient Relations representatives at the involved facility. We here were not there and did not screw up your spouse's IV and do not owe you any explanation. I will grant you this: I have seen situations where "privacy" or "HIPAA" or some other excuse has been used inappropriately. I do think it's important for us to facilitate family support whenever humanly possible/feasible. However, as I'm sure you know, there are many people who actually do not provide support and instead are hypercritical (sometimes very inappropriately so) due solely to their own emotions before even giving anyone a chance to do anything right or wrong. There have always been nurses who are more visibly kind, those who are visibly mean, and everything in between. However, if you're looking for something to be upset about, the "business of healthcare" has done no favors for nurse-patient relationships nor for nurses' opportunities to develop rapports with patients/families nor for delivery of care that most lay people would agree was "caring." No, we don't. You need to address your concerns directly with the facility in question. if a mistake happens, you'd be highly upset and want to sue. Examples - Nurses do not want spouses back in pre op - well first of all that is their right if they want their spouse with them. No, it really isn't. And please direct your anger elsewhere, like at the people you really have an issue with. Do you walk up to random people on the street and start yelling at them and calling them names because you're cheesed off at someone else? Also, calling a nurse's missed attempt at an IV a "screwup" is over the top. Pot meet kettle. Nobody is entitled to be in an area where medical care is being provided, particularly when or if the patient has requested someone not be present or when the care of someone you don't even know can be witnessed in any way OR if you are creating an environment that inhibits concentration, calm and good care. That doesn't make us ***chy or bossy. It makes us good nurses. I am sorry that ruffles your feathers. We are just doing our job and would do the same for you if you were the patient in the bed. Try not to judge harshly simply because you didn't get your way. For the record, IV starts are not a "gimme" kind of skill. They are often difficult to do for even the most experienced. It in no way reflects on someone being a bad nurse. None of us go to work in the morning (or evening or middle of the night, on holidays, nights, weekends etc) hoping to hurt someone. Yes, we know it hurts. Yes, we are aware you would prefer it be gotten in one stick or not have to happen at all. Creating a tense environment due to normal human error is going to get you kicked out of the room every time. I won't ask you to explain yourself. I will, however, encourage you to temper your expectations of perfection.